The Pacific Northwest is known for producing some of the best craft beer in the nation, and we’re not surprised: more than 99 percent of domestic hops are grown here. In Seattle, craft breweries dot the landscape. From stouts to porters (both imperial and Russian) to zesty IPAs and sours, the Emerald City’s beer culture offers whatever you fancy—on tap and served cold. Here are some of the city’s best breweries and brewpubs by neighborhood. In 2015, Reuben’s moved to a roomier location with space to create upped quantities of the good stuff. It’s no wonder why. Reuben’s cranks out award-winning, delectable beverages. Just like Seattle, their taproom is comfortable and laid back. 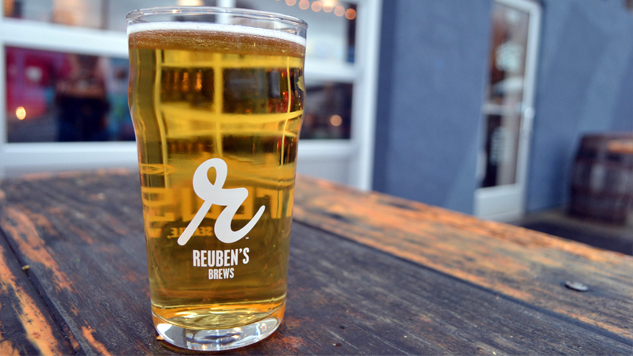 And, more than other spots, Reuben’s feels like a community-gathering place, where you go to connect with people you know and people you will know after a pint. Reuben’s carries something for every beer drinker and on game days, sports fans flock here for the comradery and the massive TV screen. Don some blue or green and you’ll fit right in with the locals. Lucky Envelope sits near several of Seattle’s most popular breweries and definitely deserves a spot on your Ballard/Fremont beer itinerary. Peddler Brewing pays homage to two-wheeled transportation. Bad Jimmy’s is known for its takes on classic beer styles, with concoctions like habanero amber and kiwi cherry gose. On a warm day, Fremont Brewing’s massive beer garden across from Lake Union is a top pick among Seattleites. Starting in the 1900s, Capitol Hill was Seattle’s original auto row—where people went to purchase a car or get theirs serviced. Optimism brought an entire block back to life when it opened its doors in a long-vacant auto shop. Brewing equipment sits in the middle of the space, giving drinkers an up-close look at what it takes to craft what we all enjoy. Optimism’s beer menu includes tasting notes and photos, but not beer styles. They believe that traditional labels keep beer drinkers in their comfort zones. But if you want to be doubly sure you’re not ordering whichever kind of beer least suits you, just ask. Feeling like a local beer in a slightly macabre setting? Try The Pine Box, a bar housed in a former mortuary. EuroPub pours Belgian and Eastern European beers for Capitol Hill denizens. Elysian Brewing Company is a monolith worth venturing to. Chuck’s Hop Shop is part taproom and part bottle shop, and the space feels like an old bait shop. But instead of selling minnows, Chuck’s sells beer, including local and regional staples and coveted special releases. Machine House Brewery is the only spot in town where you’ll find a full lineup of traditional, hand-pumped, cask-poured English-style ales. One of its founders is a British expat who honed his brew-making skills across the pond. While many establishments serve “pints” in glasses that don’t actually hold 16 ounces of beer, Machine House doesn’t skimp. Its pints are hefty and honest, served up in traditional, 20 ounce English nonic glasses. Located in the red brick factory building that once housed the original Rainier brewery, Machine House’s low alcohol, room temperature ales are perfect for easy sipping and longer stays. Lowercase Brewing is one of Georgetown’s newest spots and one of a growing contingency of breweries that offers tallboys to go. In Seattle, you’ve got to have a preference—you’re either a Manny’s or a Mac & Jack’s. The catch is, Manny’s is the one brewed in Seattle—at Georgetown Brewing, while Mac & Jack’s is located outside of Seattle. Counterbalance Brewing Company and Two Beers Brewing Co. are also in or around Georgetown, and both serve up great beer in a non-uppity fashion. Holy Mountain (pictured above) takes the top spot for many local aficionados. Technically located in Interbay on the edge of Queen Anne, Holy Mountain is where you go for innovative beer styles, combinations and infused options you won’t find anywhere else, like their recent Dark Retreat sour ale aged in oak barrels with blackberries and boysenberries. The taproom boasts an industrial, minimalist feel, complete with white subway tiles and large pendant lights. Their branding gives off a slightly sinister, witchcraft-y feel, but the real magic is in what they serve. Short on time in Seattle? Hit up Old Stove Brewing Co. at Pike Place Market, where you’ll end up at some point anyway. Rooftop Brewing Company’s weatherproof deck is where it’s at all year long. And with a former Elysian experimental brewer at the helm, don’t be surprised to see some interesting options at Cloudburst Brewing, like their oyster stout made with the shells of Baywater Sweets. Those in need of a dunkel or helles, get to Queen Anne Beer Hall. Like the rest of Seattle, the University District is growing rapidly—new residents and students are driving the need for more housing and denser development near the University of Washington. Floating Bridge Brewing opened up this summer to appease the growing contingency of U-District dwellers. Just off the highway and steps from the neighborhood’s main drag, Floating Bridge (pictured above) is located in the former Rainbow Tavern, a storied live music venue that is said to have hosted some of the greats. Paying homage to the Interstate 90 floating bridge on the other side of campus, several beers on tap at this family-run operation—including the Tweed Cap Scottish Ale, Bootprint Brown and Cascadian Dark Ale—are the perfect match for the soggiest of Seattle days. Shultzy’s, The College Inn Pub and Big Time Brewery are all located on The Ave., a popular spot for shopping, dining and drinking near the University of Washington campus. None of them are especially new or shiny, but you’ll find good beer and local folks at each. Biking on the Burke Gilman Trail? Stop off at Ravenna Brewing just past University Village. Kelly Knickerbocker is a Seattle-based writer with Texas roots. Find her on Instagram or Twitter at @kellyknick13.